This beautiful 1912 home is located 3 blocks from Downtown Flagstaff and a little over an hour from the splendor of the Grand Canyon. We feauture large, comfortable rooms. Within walking distance of shops, restaurants and pubs. 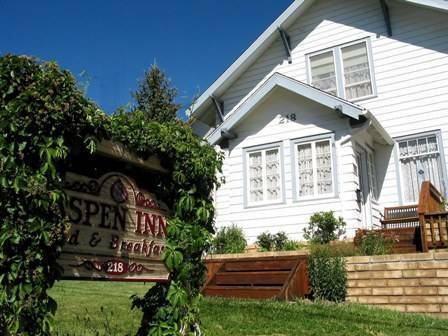 An excellent gourmet breakfast is served at the Aspen Inn. We offer a true Bed & Breakfast experience with all the amenities. Wyatts Room - Large room with King Size bed, private bath and side alcove with twin bed. Peach Room - Large room with King Size bed, private bath (double wide shower). Wilson Room - Large room with King Size bed, private bath, private entrance and gas fireplace. Emily's room - Cozy room with Queen Size bed, private bath (shower/tub combination). We are located 3 blocks from the Downtown area on the edge of town. 25% deposit will be refunded if the room can be re-rented. From interstate 17 or 40 exit number 195 travel 1. 5 miles on Milton road and turn left (north) on Elden Street travel 2. 5 blocks and we are on the right. Nearest airport: Flagstaff Airport is 3 miles away.